UANZATE, Italy - Dover Digital Printing and MS Printing Solutions have recently opened a new Center of Excellence at Guanzate in the Province of Como, Lombardy. The 3,000-sq.-m. high-tech digital printing facility will serve as an academy and technical training school for the digital printing industry, with a remit to train future machine operators, print technicians and designers. Equipped with the latest printers from MS Printing Solutions, the center will also showcase products from other Dover Digital Printing companies such as French RIP software specialists Caldera and ink manufacturers JK Group. 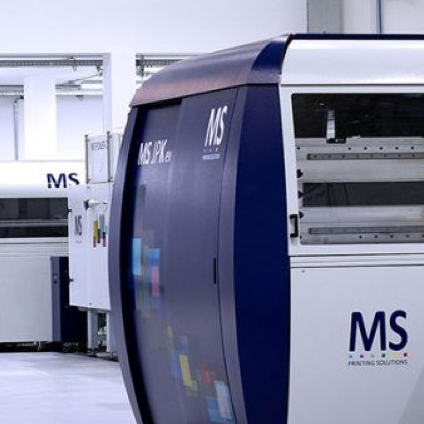 As specialists in producing printers for the textile industry, the new center was designed to focus on textile printing innovation and, in particular, on the green technology which led to the development of MS Printing Solutions ‘LaRio’ digital printer. The purpose of setting up the new Center of Excellence was to create a fully operational textile printing showroom that would allow visitors to see all the latest MS equipment set up for demos and training. There are state-of-the-art training rooms where training courses are delivered by experienced industry experts. The center is staffed by a team of operators, trainers, software designers and plant managers, and currently showcases the LaRio, the JPK 3.2m, the JP7, the Impres 3.2m, the JP4 1.8, the JP3, utilizing RIP software from Caldera and JK Group inks, as well as MS steamers and dryers.